Navratri, which means “Nine Nights” is a 9 night, 10 day long celebration during which nine forms of Devi/Shakti are worshipped. The 10th day is the festival of Dussehra or Vijayadashmi. 1.) Śailaputrī (Sati, Daughter of the Himālayas, Wife of Lord Shiva) “Shail” means mountains, “Putri” means daughter.Variously known as Sati Bhavani, Parvati orHemavati, the daughter of the King of the Mountains Himavan, is called ‘Shailputri“. 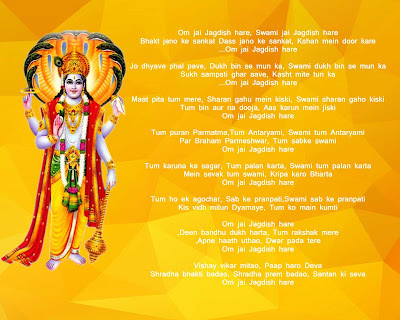 The first among nine Durgas and her worship takes place on the first day of Navaratri – the nine divine nights. The embodiment of the power of Brahma, Vishnu and Shiva, she rides a bull and carries a trident and a lotus in her two hands. 2.) Brahmachāriṇī (One who observes the state of celibacy doing penance) She is worshipped on the second day of Navaratri and is the second form of Mother Goddess. Bharmacharinimeans one who practices devout austerity. She enlightens us in the magnificent embodiment of Durga with great powers and divine grace. Brahma that is who observes penance (tapa) and good conduct. Here “Brahma” means “Tapa”. The idol of this Goddess is very gorgeous. On left hand shehold a “Kumbha” or water pot, and the right hand holds a rosary. She personifies love and loyalty. Bhramcharini is the store house of knowledge and wisdom. Rudraksha beads are her most adored ornaments. She is blissful and endows happiness, peace, prosperity and grace upon all devotees who worship her. Filled with bliss and happiness, she is the way to emancipation – Moksha. 3.) Chandraghaṇṭā ( One who bears the moon in her necklace ) The third facet of Goddess Durga is ‘Chandraghanta‘, who is worshipped on the third day of Navaratri, for peace, tranquility and prosperity in life. She has a ‘chandra’ or half moon in her forehead in the shape of a ‘ghanta’ or bell. That is why she is called ‘Chandraghanta‘. She is Golden in color, possesses ten hands and 3 eyes. Eight of her hands display weapons while the remaining two are respectively in the mudras of gestures of boon giving and stopping harm. She is charming, has a golden bright complexion and rides a lion. She is the apostle of bravery and possesses great strength to fight in the battle against demons. 4.) Kūṣmāṇḍa (the creator of the universe) Kushmanda is the fourth form of the mother goddess and is worshipped on the fourth day of Navaratri. 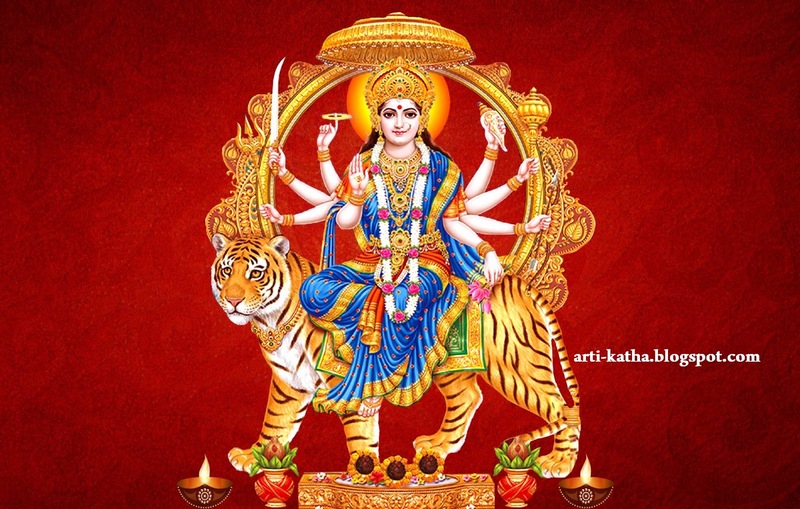 Shepossessed of eight arms, holding a weapons and a mala ( rosary), her mount is the tiger and She emanates a solar aura.The meaning of the name ‘Ku-shm-anda’ is as follows: ‘Ku‘ = a little; ‘ushma‘ = ‘warmth’; ‘anda‘ = ‘the cosmic egg’. So she is considered the creator of the universe. The universe was no more than a void full of darkness, until her light spreads in all directions like rays from the sun. 5.) Skanda-Mātā (The mother of Skanda, Kārttikeya, born out of her powers)The fifth aspect of the Mother Durga is known as ‘Skanda Mata‘ – the mother of Skanda or Lord Kartikeya, who was chosen by gods as their commander in chief in the war against the demons. 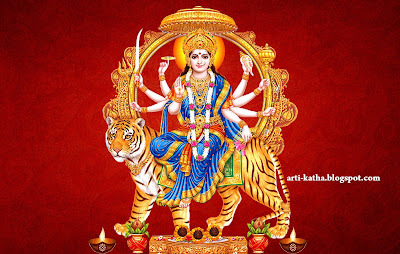 She is worshipped on thefifth day of Navaratri. 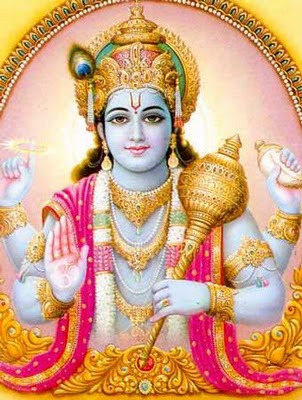 She is accompanied by the Lord Skanda in his infant form. Rising a lion as Her chosen vehicle, She holds Her son skanda on her lap. She has three eyes and four hands; two hands holds lotuses while the other two hand display defending and granting mudras, respectively. Its said, by the merch of Skandmata, even the fool becomes an ocean of knowledge. 6.) Kātyāyanī (The daughter of sage Kātyāyana, who incarnated to help the Devas)The sixth form of Mother Durga is known as ‘Katyayani’, who is worshiped on the six day of Navaratri. Thelegend behind her name is that there was a great sage called Kata, who had a son named Katya. Kata was very famous and renowned in the lineage of saints. He underwent long austerities and penance in order to receive the grace of the Mother Goddess. He wished to have a daughter in the form of a goddess. According to his wish and desire the Mother Goddess granted his request. Katyayani was born to Kata as an avatar of Durga. 7.) Kālarātrī (black as night, destroyer of Kālī)This is the seventh form of Mother Durga and is worshipped on the seventh day of Navaratri. She has a dark complexion, disheveled hair and a fearlessness posture. She has three eyes that shine bright and terrible flames emanate from her breath. Black (or blue ) skin with bountiful hair and 4 hands, 2 clutching a cleaver and a torch, while the remaining 2 are in the mudras of “giving” and “protecting“. Her left upper hand holds a thorn-like weapon, made of iron and there is a dragger in the lower left hand. Her vehicle is a faithful donkey. She is the destroyer of darkness and ignorance. 8.) Mahāgaurī (the wife of Lord Shiva, doing great penance)She is worshipped on the eighth day of Navaratri. Her power is unfailing and instantly fruitful. As a result of her worship, all sins of past, present and future get washed away and devotees get purified in all aspects of life.MahaGauri is intelligent, peaceful and calm. Due to her long austerities in the deep forests of the Himalayas, she developed a dark complexion. When Lord Shiva cleaned her with the water of the Ganges, her body regained its beauty and she came to be known asMahaGauri, which mean extremely white. Her left upper hand holds a thorn-like weapon, made of iron and there is a dragger in the lower left hand. She is as white as a conch, moon and Jasmine. She is of eight years old. With four arms and the fairest complexion of all theDurga Shaktis, Mahagauri radiates peace and compassion. She is often dressed in a white or green sari. She holds a drum and a trident and is often depicted riding a bull. 9.) Siddhidātrī (Provider of Siddhis, giver of mystic powers)Siddhidatri is the ninth form of Goddess. She is worshipped on the ninth day of Navaratri. There are eight Siddhis , they are- Anima, Mahima, Garima, Laghima, Prapti, Prakamya, Iishitva and Vashitva.Siddhidatri has supernatural healing powers. She has four arms and she is always in a blissful happy enchanting pose. She rides on the lion as her vehicle. She blesses all Gods, saints, yogis, tantrics and all devotees as a manifestation of the Mother Goddess. It is said in “Devipuran” that the Supreme God Shiv got all these Siddhies by worshipping Maha Shakti. 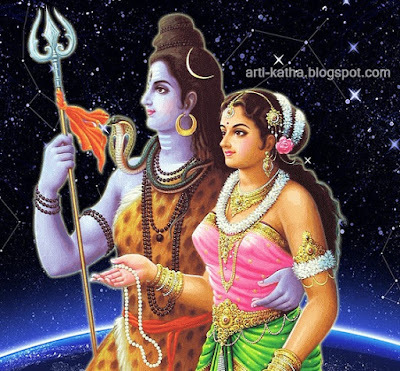 With her gratitude the half body of Shiv has became of Goddess and therefore his name “Ardhanarishvar” has became famous. Usually shown ensconced a lotus with four arms, She is the grantor of 26 different wishes to Her Bhaktas. Lord Brahma, the creator, granted Mahishasura the "buffalo demon," a boon that protected him from any man in the world . Empowered by this gift, Mahishasura set out to conquer the world, heaven and the world, and brought about the defeat of the king of deities, Indra. At the pleading of Indra, the king of the Gods, Lords Brahma, Vishnu and Shiva created Devi Durga, by combining their own divine powers (shakti). Endowed with the trinity's shakti, Durga proved to be a formidable opponent who fought Mahisa for nine days, beheading him on the tenth. The nine nights known as Navratri, symbolize the nine days of battle between Devi Durga and Mahishasura, while the tenth day, which is vijayadashami-literally means the victorious tenth day of conquest of good over evil. There is another story which includes Lord Rama & Ravana. According to the Ramayana, Rama invoked the goddess Durga in his epic battle against Ravana. Although Goddess Durga was traditionally worshipped in the late spring, due to contingencies of battle, Lord Rama had to invoke her in the form of astam (eighth) Mahavidya (Maa Bagla) in the autumn and thus is known as akaal bodhan (invoking out of scheduled time). This autumnal ritual was different from the conventional Durga Puja, which is usually celebrated in the springtime. So, this Puja is also known as 'akal-bodhan' or out-of-season ('akal') worship ('bodhan'). This Rama's date for the Navaratri puja has now gained ascendancy and culminates with Dussehra in North India on the following day.